Given what I've researched today (linked to earlier) I'm predicting it is easier to accelerate a conductive cone (pointy end first) than a sphere under very high energy conditions and acceleration. I think that under normal every day conditions the effect would be insignificant. Both internal and external boundary conditions are important to emdrive. Seems logical to me that the Nasa test article would produce more thrust while rotated pointy end up than down due to acceleration of gravity, barely. I need help formalizing this. Prove me wrong. The NASA Eagleworks tests showed that with the PTFE ("Teflon") dielectric resonator removed there was NO measurable thrust. 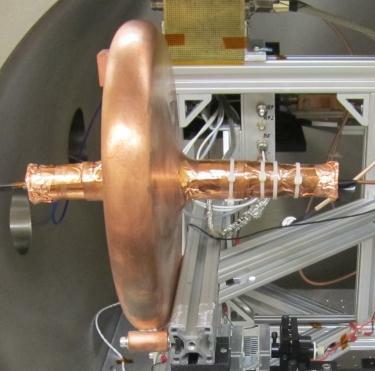 Can you predict that removing the dielectric resonator will result in no measurable thrust? Already did. In earlier post. I suggested PVDF is better. the Cannae drive is shaped like a pillbox (see picture). It is symmetric except for the dielectric resonator being installed in the long pipe side. Can you predict thrust for the Cannae drive? I don't think I said this here, but I marked up the Nasa paper with a line showing where to lop off the bell because it makes no difference. Just the tube with dielectric in it. Those are the only active useful parts. The area where the tube meets the bell is tapered like a very short cone too. edit, er bell I mean pillbox. Polyvinylidene difluoride (it is yet another thermoplastic fluoropolymer). Or because of its heat resistance? Or something else? Is there a phase you prefer? alpha , beta , or gamma phases ? I was wanting to use large 1x2 meter sheets layered together to store energy for electric cars or something. I abandoned it when I learned that it has a low Curie temperature. But it is highly polarizable and ferroelectric. I was also trying to tie it in with Abraham-Minkowski. Interesting, but how about energy from other universes? I'm far too frustrated by having had an actual Stolichnaya martini tonite, thanks to Elizabeth, my mixoligist. who drinks these things, anyhow? Bottom line. Forget about "other universes". And what the heck does Rodal see in martinis? Probably he's totally wrong in his math as well. Solo dicendo. Well early on I was trying to explain it all away as a momentum transfer from photons to the cavity via the dielectric (Abraham-Minkowski) which may be part of it, or at least at these low energies, most of it. For the life of me I couldn't think of a way to transfer any momentum to the QV and I had a lot of even crazier ideas early on with a bunch of Unruh this or that in it. But I always maintained that the dielectric was essential until yesterday pretty much when I discovered the work of Dr Mike McCulloch. I was grabbing at a bunch of ideas until the casimir stuff became clearer to me. I think the dielectric in the waveguide would do best at half wave intervals. Since the test article was a cone, transverse waves go along a radius not around if I remember right, so the pic can't help us. Probably screwed that up but the jist is in circular waveguides you have TEM vectors, square/rectangular just TE. I have very low confidence we'll ever have the technology to achieve the kind of energies and accelerations necessary to make this thing useful. It may appear plausible but not practical. Maybe we'd be better off using sound instead of rf and use a sound room to create boundaries. Either that and shrink down the cavities, cluster them in a wafer, cap them, and pump very high ghz or thz frequencies into them. Gravitation hasn't been shown to communicate outside its local spacetime curvature or even proven it is field theoretic. No gravity waves. Einstein said it was local curvature in spacetime. No ripples to communicate via in spacetime have been found. Find one gravity wave and gravitational Inertia will work. Even non locally across the cosmos because phase velocities are superluminal. Gravity is a how not a why. I'm surprised Feynman invented mathematical time travel to shoehorn that view of Inertia. This is fun. Also wmap has shown a lumpy cosmos with a dipole anisotropy. Here at home we are dominated by the mass of a planet moon and star and a supermassive blackhole, none of which contribute to any inertial dipole moments. I invited him. I hope he gets over here. His credentials and willingness to communicate leveraging the Internet are awesome. ...Getting unlimited energy source by just radiating away tons of negative mass as debt never to be paid. This is brilliant ! That should easily find some financial backer. Or another way to show to people that negative mass is not likely to exist in reality. Or that it may exist but can't be put at work in a rigid arrangement relative to positive mass (like in a diametric drive) because it would be space-like trajectories while positive mass is always time-like ? Aren't negative mass what is called tachyons and always moving >c, or am I mixing two different concepts ? Not sure this is a definitive answer also, maybe we could still devise how two streams of periodic lumps of positive/negative mass could still forever interfere even if one is <c and the other >c. A circular stream of tachyons... my brain hurts, any contradictions with causality ? Aren't negative mass what is called tachyons and always moving >c, or am I mixing two different concepts ? Different types of masses. The rest mass of a tachyon (if it exists ) must be imaginary, because the denominator of E = m c^2 /Sqrt[1 - (v/c)^2], (square root of one minus the square ratio of the velocity divided by c) is imaginary because it is traveling faster than light and the square root of a negative number is imaginary. In order for the energy of the tachyon to be real, the rest mass must be imaginary so that when the (imaginary) rest mass is divided by the (imaginary) denominator, "i" cancels out and the energy becomes a real number.